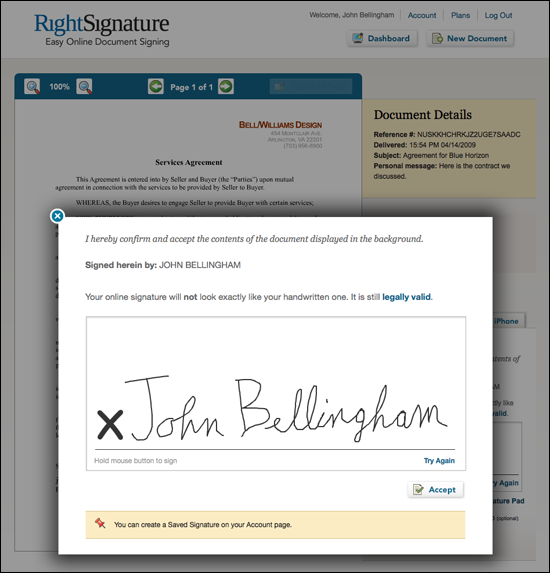 RightSignature is a great example of a company that has fully explored the implicit pain points in this standard process, and addressed them with a fully functional, simple, and intuitive product. “Digital signature” technology is cumbersome, especially when it requires one to go through extensive procedures just to authorize an approval. RightSignature does not force anyone to set up an account. An email arrives in the inbox, then the signee scribbles their autograph on the mousepad. RightSignature’s technology is in full compliance with US and EU e-signature legislative acts, which confirm the legality of electronic signatures. The feature set is impressive, with webcam photo authentication, biometric authentication, SSL encryption, Freshbooks integration, iPhone and BlackBerry signing capabilities, tools to track progress, and support for the most important file formats. It is missing SalesForce integration, which competitor DocuSign has, but every other aspect of the process is covered. Plans range from $14 to $250 per month. Entrepreneur Value: 5/5 â Don’t depend on Adobe alone. Cool, easy, and priced fairly. Personal Value: 1/5 – Not yet. But someday.